Seed Mackall, LLP has been providing outstanding legal services to its clients for more than 35 years. They are very active in the mergers & acquisitions space, and regularly use SecureDocs Virtual Data Room to successfully complete deals for their clients. After using using other products like Intralinks, SmartRoom and various platforms provided by the big financial printers, and most recently Firmex extensively they determined that they needed a solution that was both more flexible and affordable than the other solutions previously used, and landed on SecureDocs as the best data room solution for their business. Seed Mackall struggled with asking their clients to spend huge amounts of money on data rooms during M&A transactions. Often there is little time to prepare for a transaction, and other solutions were too cumbersome to get off the ground quickly, and with little notice. They work with many different clients, and needed a solution that is flexible enough to accommodate each client's unique needs. Seed Mackall began using SecureDocs Virtual Data Room in September of 2016, and immediately found that our solution was easy-to implement and even easier to use, and most importantly - affordably priced. SecureDocs has saved both Seed Mackall and their clients thousands of dollars. SecureDocs makes it possible for Seed Mackall to set up a fully-functioning data room the same day that their clients tell them about the transaction. 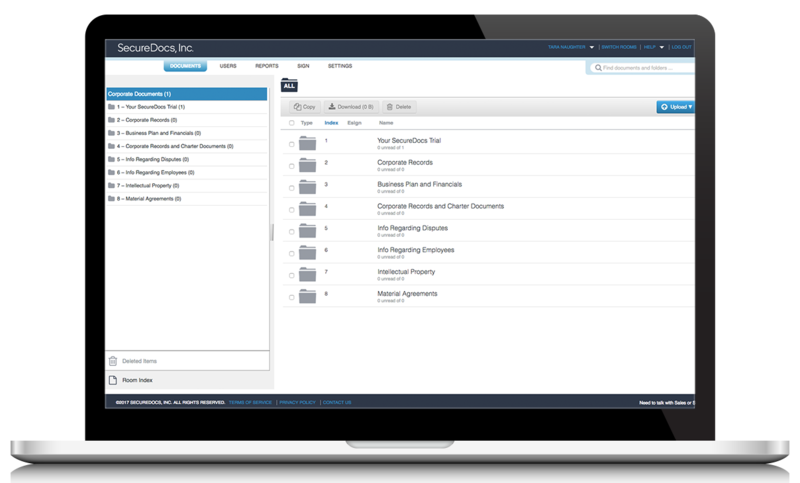 Ready to try SecureDocs Virtual Data Room?